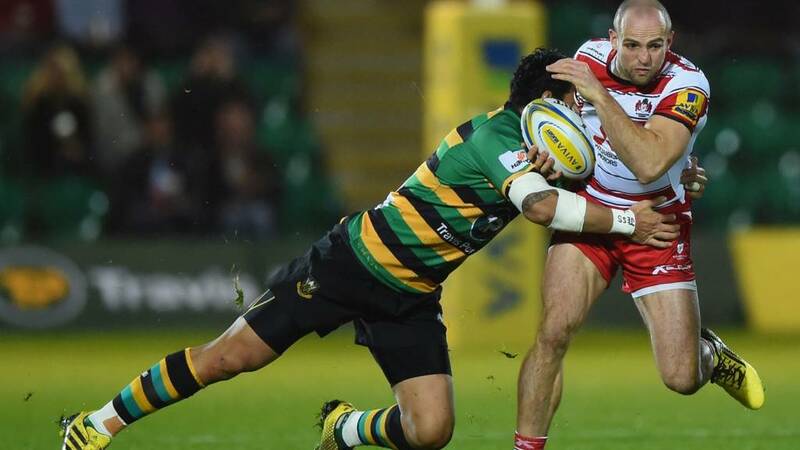 That match may not live long in the memory - but Jim Mallinder's Northampton Saints won't care a jot. The boot of Stephen Myler, as reliable as ever from the tee, kept them on top in a match they never really looked like losing. It was a quiet first run out for new boy Victor Matfield, who we're probably all hoping will show us what he is all about as he adjusts to English rugby. For Gloucester, it continues their mixed start to the season, having won two and lost three of their opening matches. We're back tomorrow for four Premiership matches, but until then, goodnight! This was a potential banana skin for Northampton. These were two evenly matched sides but Saints have been better on the night. Well, it's been scrappy, but Northampton will be very happy to take the victory and end a two-match losing streak in the Premiership and move up the table from 10th position. Gloucester, who had started the day one place above them, never really got into the game. Sam Dickinson comes ever so close to getting Northampton's first try this evening, but is held up just by the line off the back of that scrum. This game is just ticking along until the final whistle. Greg Garner is true to his word, and Gloucester prop Yann Thomas is sent to the bin for infringing at the scrum, bringing the man he replaced on 20 minutes Paddy McAllister back into the fray. This game appears to be going away from Gloucester now, as Northampton have the ball in the visitors' half, before kicking forward. Full-back Rob Cook again shows poor hands, and gives Saints a scrum 15 metres from the away side's tryline. Stephen Myler has been so accurate from the tee this evening, but from the left-hand side his penalty kick is wayward and goes left of the posts. Still, Saints look like continuing their return to form with victory tonight after two straight wins in Europe. Trevor Woodman has a lot of analysis work to do, and work on the scrum, generally this week as it has not been an effective weapon for them tonight. Gloucester are penalised for standing in the scrum, and Greg Garner calls the Cherry and Whites' captain Billy Twelvetrees over to warn him that someone will see yellow next time they infringe at a scrum. They just haven't been able to handle it today. Some outstanding defending by Lee Dickson, using his knees after a kick through bounces off the posts, has somehow managed to keep Gloucester out. The ball gets back into away hands, but is knocked forward and gives Northampton the scrum. It's been that sort of day for David Humphreys' side. Northampton can't get out and capitalise on Foden's work, and eventually the visitors win a penalty, Billy Twelvetrees kicking it just by their opposition tryline. A big push is needed here. Northampton's Ben Foden has shown why Jim Mallinder said he could return to the England fold there. The full-back managed to reach a bouncing kick forward before the lightning quick Jonny May, taking it round him, before smashing it against an opposition player to win his side a line-out. Nice stuff. Easy for the England fly-half as Stephen Myler slots yet another successful kick. Gloucester need something special to get back into this match. Oh dear Rob Cook! The Gloucester full-back comically drops a high kick, giving Saints a scrum in the opposition half. Matfield seems to have given Saints a morale boost, and replacement JJ Hanrahan and Ahsee Tuala combine down the right and break to bring the crowd to their feet. They are held up, but Gloucester give away another penalty in front of the points - leaving Stephen Myler an easy penalty to extend his side's lead. The teams are taking on that wind now, with both sides kicking for territory, and eventually after Charlie Sharples kick into space, Ben Foden has no alternative but to smash out of play in his own half. That allows South Africa legend Victor Matfield to take to the field to make his much-anticipated Northampton debut in place of Michael Patterson. Bet he's not seen something like this wind for a while! We've just been shown some pictures of the flag at Franklin's Gardens and it's no surprise the ball is so unpredictable when up in the air. The flag was almost being blown off it's pole! (Slight hyperbole). Back on the pitch, Gloucester have a scrum in the middle of the park which Northampton again win a penalty off. That has been the difference so far. It is not functioning at the moment - we’ve said before that this coaching team isn’t afraid to make a change. There is not dominance, we need that little bit of magic. A little bit of a break in play as Gloucester wing Charlie Sharples is down on the floor receiving treatment. It's been a brutal affair so far. What do you make of this match so far? Let us know using #bbcrugby on Twitter. Without any tryline action so far this match, we've just had two real chances in the space of 20 seconds! First, Northampton come so close the line off the back of a ruck, but a forward drops the ball with a chance of glory. I’m not sure if you have been watching the Last Kingdom on BBC 2? Richard Hibbard could have come straight out of that cast! Argentine Mariano Galarza has just come on for Gloucester to make his first appearance since receiving a nine-week ban at this summer's World Cup. Can his fresh legs make any dent on the scoreboard. It's the closest we've come to a sight of the tryline all match when Billy Twelvetrees' kick is charged down, but Luther Burrell can't hold on to Stephen Myler's pass and the try is averted for the Cherry and Whites. Gloucester hook the ball away, but Ben Foden's kick back is absolutely massive, and Jonny May hopes it will go over the try line, but doesn't giving him little option but to kick poorly away. However, Saints can't capitalise and the visitors win the penalty. Northampton again win the ball at the breakdown off the back of the line-out, this is proving all to easy for the hosts at the moment, but Jonny May catches a high kick inside his 22 and the danger is over. Incidentally, Tom Wood's sin-bin is over. Gloucester lose the ball off the back of a line-out - not for the first time this evening - and Northampton keep the ball turning over before kicking for touch by Gloucester's 22. High kicks are causing chaos in this swirling wind. It's like watching a bunch of salmons leaping up in the air as they try to catch the ball. Northampton's Ben Foden takes control and clears the ball into touch. Northampton Saints fly-half Stephen Myler gets us back under way at Franklin's Gardens. And you'll be delighted to hear that the East Midlands rain has stopped. So what do you make of all of that kerfuffle then? What can Gloucester do to stop Northampton's dominance at the scrum? Can Jim Mallinder's side get their much-heralded backs into the game more? Will we see Victor Matfield later on today? Let's be totally honest here, this has not been the prettiest half of rugby you are ever likely to watch. The conditions have certainly not helped, but let's be hoping for fewer breakdown problems and a couple more breaks to get us off our seats. The first half ends with Gloucester looking dangerous around Northampton's line, but a beast of a tackle from Luther Burrell wins the ball back and Saints kick for touch to bring an end to the half. Gloucester's Willi Heinz, in for Greig Laidlaw, tries to use the wind when his side gain some metres, but Saints' Ben Foden did well in the wind to catch inside his own 22 with Charlie Sharples running right at him. Northampton break with pace, and Ben Foden, a man who Jim Mallinder said could make an England return if he retains his current form, breaks through the Gloucester line to give his side yards. Gloucester's Matt Kvesic then infringes, but Stephen Myler's kick is too long in the wind and gives the visitors a scrum. Twelvetrees nips it slightly to the left of the posts and the scores remain the same. They have to make use of this man advantage before the break though. One man who Northampton will be looking to get into the game tonight is George North, the star Wales wing who signed a new contract on Thursday to end speculation over his future. He was never leaving, was he? Meanwhile, Gloucester have a scrum on Saints' 22 and lose the ball after a few passes. A familiar story so far. Gloucester have a scrum right up to the Northampton line, but even the introduction of Yann Thomas cannot change the visitors' fortunes in the pack, and the ball is won by Saints and kicked away to touch. That was a golden chance to add to the scoreboard. Billy Twelvetrees, the man with the greatest nickname in rugby, '36', has his side on the board with a difficult looking penalty from the left in the swirling wind. The Cherry and Whites are on the board. Well after that warning from the ref, it appears like David Humpreys has seen enough to realise Paddy McAllister can't deal with Kieran Brookes at the scrum and the prop comes off for Yann Thomas. Yet again, Northampton win a penalty off the back of a scrum, and the ref calls over captain Billy Twelvetrees to warn his loosehead prop Paddy McAllister, at fault for three penalties already. Stephen Myler duly obliges with the kick. After a bit of an injury break, it's a Saints scrum around the Gloucester 22. They've been dominant so far, can they force the issue? Wave after wave of Northampton players are running at the Gloucester defence, but David Humphreys' men stand strong, before Bill Meakes infringes. The Cherry and Whites finally have a bit of ball in the opposition half, and spread the play from left to right and back again, but a poor pass allows Saints' Luther Burrell to grab the ball and kick forward. The England centre doesn't have the legs, but Charlie Sharples can't get out of trouble and gives Saints a line-out just five metres out. Gloucester front-rower John Afoa gives away a very soft penalty and Stephen Myler has an easy kick to extend his side's lead. Gloucester have barely been in this so far. Gloucester win the ball back at the breakdown, but immediately lose it, and the hosts are doing well to keep the ball going - George North almost breaking through. They are knocking on the door here. It's early in the game, but Saints' pack seem to have the upper hand tonight. They win another scrum, giving Stephen Myler the opportunity to kick downfield just inside the 22. That kick against the wind from Myler just, and I mean just, crept over through the posts. Saints have the early advantage. A quick reminder that, as well as enjoying coverage of tonight's Premiership fun at Franklin's Gardens, there's also a couple of Championship matches you can follow on this very page - with promotion hopefuls Bristol among those in action. Gloucester kick the penalty into touch but off the line-out Saints' Jamie Gibson wins it back, and the ball eventually finds its way out to George North, fresh from his new contract, on the left. The Wales wing comes up against Charlie Sharples and decides to kick, but it hits the man in Cherry and White and goes out. That was a long opening few minutes, with neither side in any hurry to get the ball into touch. Finally the ball goes dead when Northampton infringe at the breakdown. It's going to be a tactical battle tonight. Kick after kick after kick early on so far in these opening few minutes as both teams are trying to force the opposition into a mistake in the wind. Gloucester's Billy Twelvetrees gets us underway at Franklin's Gardens. Here we go. The teams are coming out in the wet and windy East Midlands. We're about to find out a lot about how these teams can deal with testing conditions tonight. Visitors Gloucester will welcome back England winger Jonny May, while Mariano Galarza is included as a replacement for the first time in this campaign. Rob Cook starts at full-back and scrum-half Will Heinz replaces Greig Laidlaw. Replacements: Dawidiuk, Thomas, Doran-Jones, Galarza, Kalamafoni, Laidlaw, Purdy, Rowan. Northampton Saints have replaced scrum-half Lee Dickson with Kahn Fotuali'i for Friday's Premiership home match against Gloucester. Among the replacements are Victor Matfield, who could make his debut if brought on, and the returning Ken Pisi. Replacements: Williams, E Waller, Hill, Matfield, Harrison, Dickson, Hanrahan, K Pisi. Gloucester also come into this match having won twice in the European break - beating Zebre and Stade Rochelais in the Challenge Cup over the last two weekends. In the Premiership, Gloucester have defeated bottom club Newcastle and newly-promoted Worcester, but defeats by Saracens and Wasps leave them a place above Northampton in the table. Northampton have had a decidedly sluggish start to the campaign. Last season's Premiership semi-finalists find themselves languishing 10th in the table having won just one of their opening four league matches of the season. But, after two victories put them top of their European Champions Cup pool and star wing George North putting speculation over his future to bed with a new contract, tonight it's time to find out if the tide is truly turning. One man who would have no problem fending off the Black Friday crowds is South Africa legend Victor Matfield. The 38-year-old 6ft 7ins lock is the Springboks' all-time record Test appearance holder and World Cup winner. Tonight he could make his Northampton Saints and Premiership debut if he comes off the bench against the Cherry and Whites, having joined Jim Mallinder's side on a one-year contract in September. Tonight's Premiership action could have an air of familiarity for those who have pounded the high streets of Britain today. Black Friday - when retail prices fall through the floor - has the potential to bring scrums of desperate shoppers to close quarters, the occasional illegal tackle over a plasma TV and, ultimately, a high turnover for the shops. At Franklin's Garden's it's not a new waffle maker people are fighting over, it's precious Premiership points. Welcome to our live text of Northampton v Gloucester.